Instructions: Cut a tag measuring 4 1/2" by 7 1/2" from a thick black cardstock. The top two angles are cut at 3/4" on both sides. Choose the pattern paper from the Words to Live by Journal pages and cut 1/4" smaller to the tag. Distress the edges with Peacock Feather distress ink and distress them further using the distressing tool. Sparkle the edges randomly with Crystal Clear Powder using an adhesive that dries clear. Cut another tag from the pattern paper 1/8" smaller to the base tag. Layer all the tags using foam dots. Take a strip 2" wide from a white cardstock and die cut a border on both the sides using Sweetheart Border Die. Layer on the base of the tag as shown. Die cut a frame from white cardstock nesting 2 outer dies of Eyelet Basic Small. Also cut a piece of one oval eyelet using only the outer die of the same set. Now cut a piece of the oval from pattern paper using the second largest die of same set and distress the edges with Peacock Feather distress ink. Stamp the sentiment in the center using Versafine black and glue the piece in the already prepared frame. 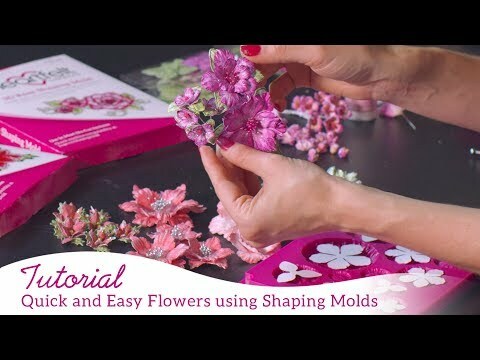 For flower molding, watch Emma's Video. Stamp the flower petals using Archival Plum and paint them using Archival Aquamarine and Leaf Green. Mold the flowers using Floral Basics Shaping Mold. Leaves are stamped using Library Green archival and painted using Leaf Green and Fern Green and then shaped using Deluxe Flower shaping kit. Stamp and die cut filler flowers using the wildwood florals. Insert flower stamens into each flower. For Butterflies, stamp the butterfly image on Vellum sheet using Versafine ink, sprinkle white heat embossing powder, dust extra powder in funnel tray and heat set it using the heating tool. Cut the image with its coordinating die. To finish the tag, make a hole on the tag using Crop a Dile and tie a seam binding ribbon along with a small tulle of the net.